Molly, the 9 month old baby girl, hysterically laughing when Bennie the dog popping out the bubbles. At first, she showed no interest in the bubbles but when Bennie started bubble popping, she wasn’t able to contain her laughter. It was maybe the funniest thing she ever saw in her entire existence because her laugh was just non-stop. It’s amazing how simple things are able to make kids happy. Her laughter is contagious that makes me, the watching, laugh with her. Just as I thought, kids and dogs can never go wrong when they are together. Dogs can make kids, even adults, happy. There’s something in them that makes us feel at peace and happy. 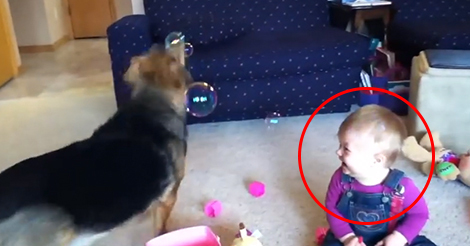 Watch the video to see Molly having a great time watching Bennie the dog popping the bubbles. Baby giggles are the best aren’t they? They just make you want to smile. 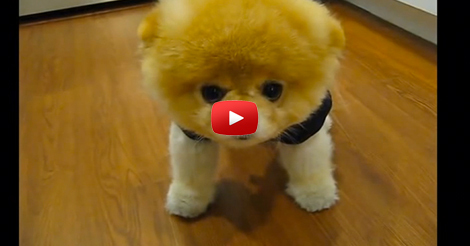 Even if you are having a rough day baby giggles can make it better even for a moment.